You are currently browsing the archives for the Cory Gardner category. Combined, about $43,781,720 was spent on campaigning just for the governor, Senate and U.S. House elections in Minnesota. Think what that money could have been used for in the state. I realize it’s not a lot of money in the total scheme of things, but it sure could have been used for something better than all the advertising. There should be no money allowed except from individuals living in the state or legislative district. No money should come from PACs, corporations or unions; only from people who can vote! PACs, corporations and unions don’t vote. There also should be no negative advertising. Period! Only advertising should be about the candidate’s position on issues and what the candidate will try to do if elected. Period! Who made this person the arbiter of what’s protected by the First Amendment and what isn’t? This is what happens when schools don’t teach their students the Constitution. It’s what happens when parents don’t teach their children the Constitution, too. It’s what happens when buffoons don’t think things through, too. Why shouldn’t PACs, corporations and unions have the right to participate in the political process? There’s nothing in the text of the First Amendment that says it only protects individuals’ right to free speech. That ad was run by NARAL Pro-Choice USA. It accused Cory Gardner, Colorado’s new senator-elect, of banning birth control. NARAL ran this slanderous ad despite their knowing that Sen.-Elect Gardner proposed making contraception available without a prescription. The best way to clean up politics isn’t by limiting citizens’ participation in the political process but by defeating the politicians whose ads are essentially smear campaigns. Politicians won’t stop running smear campaigns until they don’t work anymore. This isn’t that complicated. My campaign condemns in the harshest possible terms NARAL’s ad suggesting my opponent wants to ban birth control. While my opponent and I disagree on a wide range of issues, and while I stand ready to highlight those points of disagreement during our debates and out campaign, I can’t sit idly by while this smear campaign is carried out on my behalf. I hereby demand that NARAL Pro-Choice Colorado take this ad down immediately. In the Eighth District, there was little difference between Rick Nolan’s advertisements and Pelosi’s advertisements. In fact, the DCCC’s advertisements against Torrey Westrom and Rick Nolan’s advertisements against Stewart Mills were cookie-cutter copycats of Pelosi’s advertisements against Stewart Mills. I’ll have more to say on Rick Nolan’s spinelessness later this morning. That’s what a consistently growing lead looks like. None of these polls show Lundergan-Grimes leading. 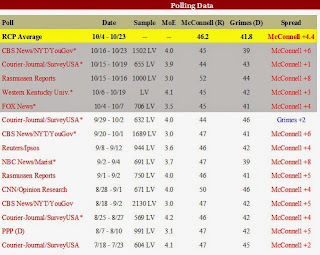 In fact, none of these polls shows Sen. McConnell’s lead inside the polls’ margin of error. There’s nothing in this graphic that suggests any of these are outliers. This weekend’s developments don’t hint that Sen. McConnell will become the next Senate Majority Leader. 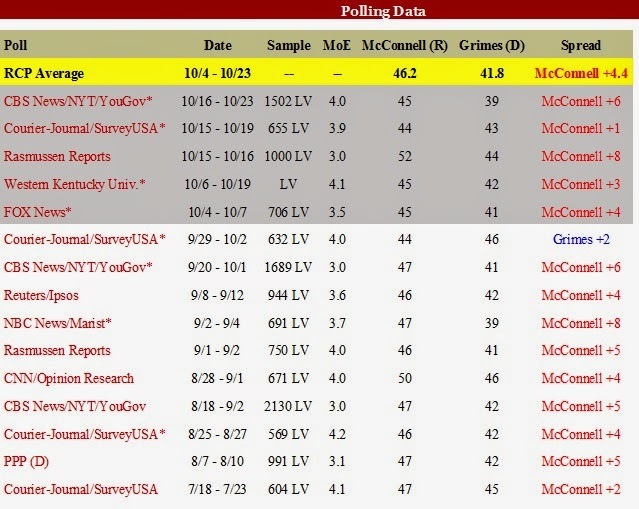 This weekend’s polls strongly suggest that Sen. McConnell will be the Senate Majority Leader sooner rather than later. That’s before talking about Montana, South Dakota or West Virginia, which are certainties. That’s before talking about Alaska or Louisiana, where Democrat incumbents appear to be living on borrowed time. To make matters worse for Democrats, that isn’t the full extent of their potential losses. Scott Brown has run a fantastic campaign in New Hampshire. Defeating Sen. Shaheen would be a mild upset but it wouldn’t stun people like his defeat of Martha Coakley in the 2010 special election. Mike McFadden’s run a solid campaign in Minnesota. While defeating Sen. Franken would be a major upset, it’s worth noting that momentum appears to be on McFadden’s side. Monday, I’ll publish a post about a wave election’s definition. Yes, this year’s election fits that description. A year ago, few would have expected the GOP would be on the ropes in Kansas, Kentucky and Georgia. Kansas Republicans haven’t lost a Senate race since 1932. Now, Sen. Pat Roberts is nearly tied with businessman Greg Orman, an independent. GOP minority leader Sen. Mitch McConnell, who hails from a deep red state, has been in a fierce battle with Democrat Alison Lundergan Grimes. 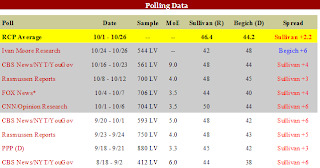 Compared to a WXIA-TV pre-election tracking poll one week ago, Democrat Michelle Nunn is upside down. One week ago, Nunn led Republican David Perdue by 2 points, 46% to 44%. Today, in a dramatic reversal, Perdue is on top, 48% to 45%, a 5-point right turn in one of the nation’s most high-visibility contests. Polling for Atlanta’s WXIA-TV 11Alive was conducted by SurveyUSA. 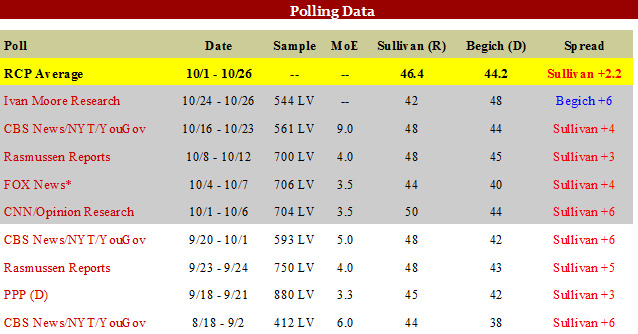 Worse for Nunn: among voters who tell SurveyUSA they have already returned a ballot, Perdue leads by 10 points. Republicans should be alarmed they’ve had to marshal so many resources to win in an environment that so overwhelmingly favors them. The number of baked-in advantages for the GOP this election cycle is remarkable. There’s the landscape: Democrats are defending 21 seats; the GOP 15. Only one of those GOP states, Maine, went for President Obama in 2012. But the Dems are struggling to hold on to seats in seven states: Alaska, Arkansas, Louisiana, Montana, North Carolina, South Dakota and West Virginia, that Obama lost. It’s important to remember that Tom Cotton is a first term congressman and that Mark Pryor inherited his father’s political machine. 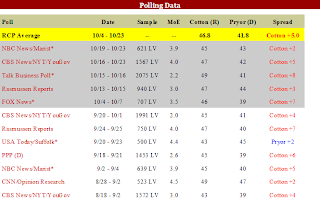 I’d be stunned if Rep. Cotton opened up a double-digit lead against Sen. Pryor. 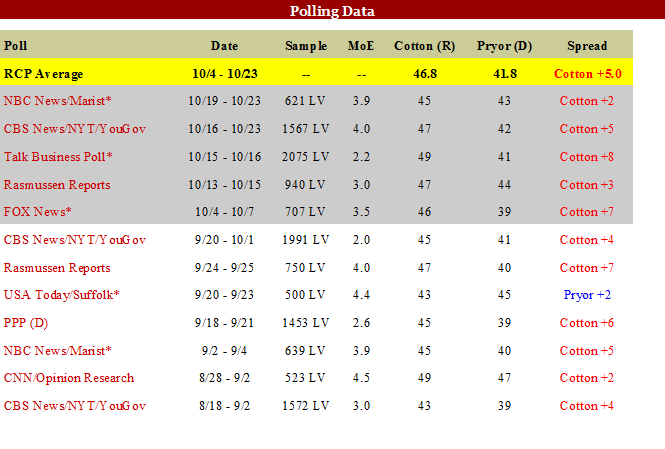 In fact, I’d be predicting a major Republican sweep if Cotton led Pryor by 10+ points. While South Dakota, Montana and West Virginia seem to be lost causes for Democrats, the most recent NBC/Marist poll shows Senate races in Colorado, Iowa, Kansas, Arkansas and North Carolina within three points. In Georgia, recent polls favor Democrat Michelle Nunn, who is fighting Rep. David Perdue. Louisiana Sen. Mary Landrieu leads her Republican opponent by a point, but is likely headed for a runoff. A Friday poll showed the Alaska Senate race in a tie. That’s top-rate spin. Colorado and Iowa weren’t on any consultant’s list of potential blue-to-red flips at the start of the year. Treating these races like they were expected to be tight races is a bit disingenuous. Cherrypicking one poll out with the Democrat leading while ignoring the other 4-6 polls showing the Republican leading is a nifty trick but it’s misleading. While I think Georgia is heading for a runoff, I wouldn’t be totally surprised if Purdue won it outright. If that happens, Republicans will be celebrating by midnight West Coast time. DC elites have tried holding onto tired incumbents or tried running candidates that sound like the Washington insiders that created this mess. That’s why Joni Ernst’s campaign is doing well in Iowa. That’s why Cory Gardner’s campaign is going well in Colorado. That’s why Tom Cotton’s campaign is going well in Arkansas. Colorado’s Senate race is just stunning: Congressman Cory Gardner is the best candidate the Republicans have in the field, despite being pounded for nine months by incumbent Democrat Mark Udall. In fact, Gardner’s image has only gotten better — he lifts people up, he’s an optimist and happy to be a conservative; in contrast, Udall’s campaign is malpractice. Joni Ernst in Iowa is a strong candidate for Republicans. Yes, she’s conservative, but her personal strength is what independents like most; she is proof that the GOP can fix its problems with female candidates and voters. Tom Cotton in Arkansas is serious, smart, disciplined, and part of the next generation of Republicans who run on what they have done, not on shrill ideology. Democrats have spent their money on shrill-sounding ads attacking their opponents as a) shills of the Koch Brothers, b) waging a war against women or c) both. They’ll turn out their progressive base but they won’t win a majority of independent voters. It is a sign that has been waving in the weeds for more than a year, since the 2013 scandals involving the IRS, the Department of Justice and the Department of Veterans Affairs started rolling out. But it appears that this administration, Democrats in general and Washington’s political class kept driving past those signs and missing them. This isn’t just about Democrats, though they’ll get hit the worst this November. I wouldn’t say that people hate Republicans but I’d say that they want to see Republicans become the party of sane-sounding solutions. The general sense is that Washington exists to serve itself, not the people back in their districts or their states. Obamacare is the perfect example of that. The Democrats wanted it so badly that some progressive politicians were willing to vote for it even if it cost them their jobs.